First Person: 4 Hours in Flint, Michigan Guide-Even though Ginanne is an American journalist based in London, England these days, her hometown of Flint, Michigan never remains far from her heart. It may be easier for reporters to focus on the bad news coming out of Flint these days, but Ginanne uses her space here to share some of the things she loves about Flint. We're familiar with a few of the things on Ginanne's list of suggestions, but there are plenty of other things we've yet to see that merit a return trip to Flint for us. Check it out at Ginanne's eponymous blog. Eat Well in Detroit in Honor of Black History Month-If you enjoy a good cup of coffee, Aaron is your go-to guy on the Web, where he regularly covers the coffee scene in the Midwest region and beyond at his elATLboy blog. This past month, he added a few sweet treats into the mix by sharing a few of his foodie and coffee discoveries in southeast Michigan. Read all about it at this article in the Awesome Mitten blog. Discovering the Unexpected Art of Detroit-Jessica describes Detroit as a "comeback" city with a "promising future" despite its past challenges and urges visitors to explore the city's rich art scene. It's fun to hear folks talk about Detroit in more glowing terms these days, although locals already know about great sites like the Detroit Institute of Arts (where we've long had a membership) and the Guardian Building (where Tim and I most recently went for a photo shoot with the Motor City Camera Club). Read about some must-see Detroit sites at the Viator Travel Blog. The most underrated museum in Cincinnati that you need to visit-I love vintage roadside attractions and signs, so visiting the American Museum of Signs has long been on my Midwest Bucket List. 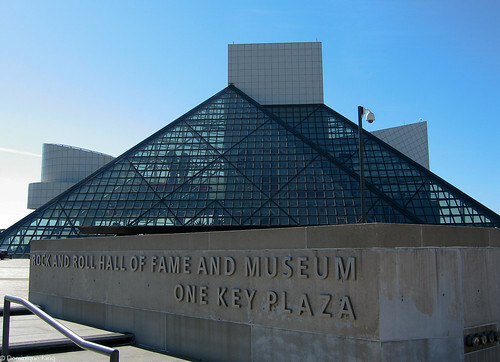 I enjoyed Nedra's story about the museum at her Adventure Mom blog, and it makes me even more anxious to take a trip to Cincinnati to check it out! 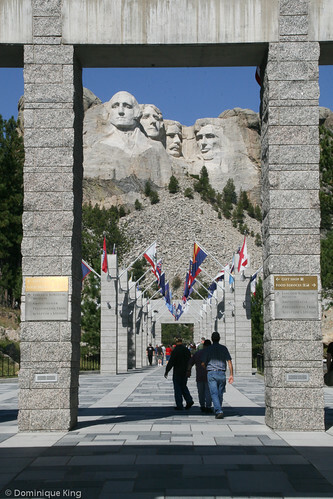 Riding South Dakota's Badlands-Diane shares the story at My Itchy Travel Feet about joining her husband on a pilgrimage to Sturgis, South Dakota for one of this country's most well-known and well-attended annual motorcycling events. Join her as she explores the state's Badlands and Black Hills via bike. Omaha Day Trip to Plattsmouth-Kim decided to check out a well-reviewed restaurant in this small Nebraska town about 20 miles south of Omaha and found plenty to do. She followed up a great meal with dessert at a classic soda fountain. Find out a little more about Plattsmouth and its history at the Oh My Omaha blog. Milwaukee Art Museum-This Museum is another site on my Midwest Bucket List, and a destination we delayed planning a trip to when I learned that it was still in the middle of a major renovation and reimagining last year. I'm hoping to get there now that the entire museum opened its doors to the public late last year. I've long admired the museum with its innovative architecture and hope we'll get there later this year. 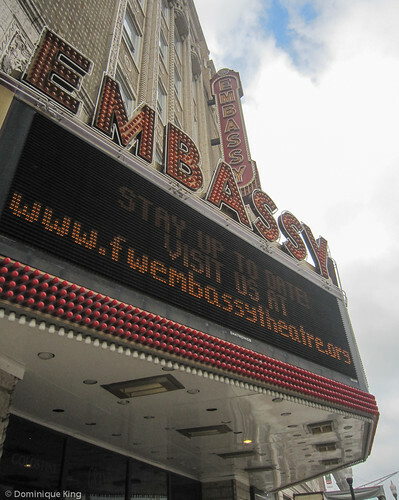 Read Kenneth's story about the museum at the Wisconsin Explorer blog. Take in Beauty and History on a Tour of the Indiana Statehouse-We loved visiting Indianapolis last year. 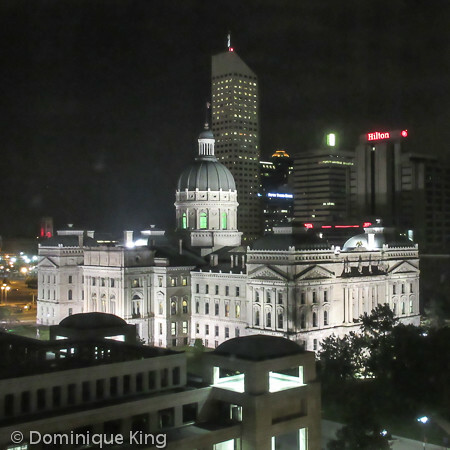 We stayed right downtown where we had a great view of Indiana's Capitol building, but one of my biggest regrets was that we did not get to tour the building on that trip. Hopefully we'll get back there in this, Indiana's Bicentennial year. Meanwhile, I enjoyed Carrie's story, which took readers on a tour of this building and told us about its history and architecture. Check it out at the Indiana Insider blog. Know Nebraska: Lincoln Highway, Lodgepole, Nebraska-This one is a follow-up to Muriel's story that I featured last month about traveling the Lincoln Highway through Nebraska. Lodgepole, once a Pony Express Station, is also an interesting stop along the historic route of the Lincoln Highway through Nebraska. 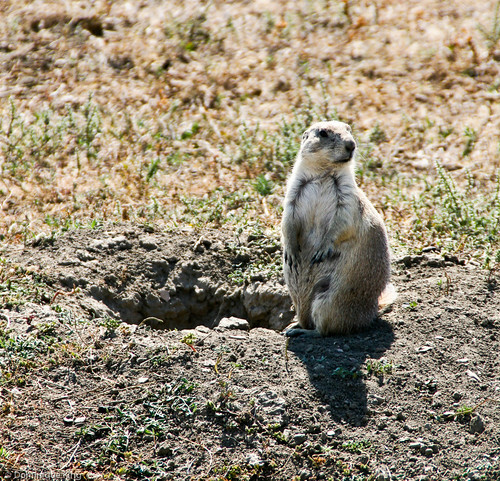 Check the story out at the Nebraska Outback blog. Star Gazing in Central Ohio-We love traveling to parts of the country where we can actually see the stars at night, as opposed to the few, isolated pinpoints of light we sometimes see through the light pollution in the big city. Check out Kayrn's account of seeing a glorious night sky in central Ohio (I'm even more jealous once I discovered she'd actually stayed in a yurt that night-another item on my Midwest Bucket List!). Check it out on the Sand and Snow...and Everywhere In Between blog. 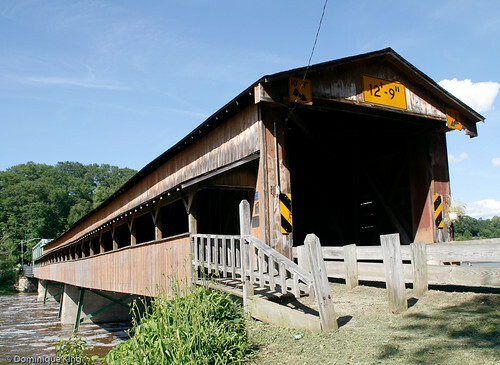 Ohio's Covered Bridges in Vinton County near Hocking Hills-I love covered bridges and liked checking out this guide to several of the scenic spans in Ohio's Vinton County. We've been thinking we'd like to return to the Hocking Hills area soon, and this looks like a nice tour to take in while exploring back roads in the area. Check out Tonya's story at The Traveling Praters' blog. 8 Small Town Michigan Overnight Getaways-Check out Shalee's list of small towns to explore in Michigan. We've visited a lot of these places, but we've still got St. James and Epoufette to see on a future trip! Check out the story at Shalee Wanders. Harpersfield Covered Bridge Metropark-I remember this bridge as being one of my favorites when we toured all of the covered bridges in Ashtabula County, Ohio. I liked seeing these recent images of this bridge from Deb and Bob at the TrekOhio blog. World's First Chicago-Type Drawbridge Undergoing Repair in Bucktown-Check out Patrick's update about the ongoing repairs at this unusual "Chicago" bascule-type bridge on the Chicago Architecture blog. The bridge, named by the American Society of Civil Engineers as an Engineering Landmark and a Chicago Landmark by the city, is more than 100 years old. 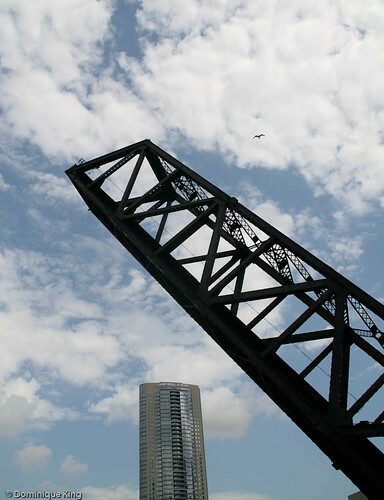 Check out Patrick's book, Chicago River Bridges, to learn more about this bridge and many others in the Windy City. Also check out my story about a bascule bridge in Ashtabula, Ohio and see an image of the bridge in action. Historic Bridge Park: 5 Restored Truss Bridges in One Location-Check out one of the newest entries on my Midwest bucket list. 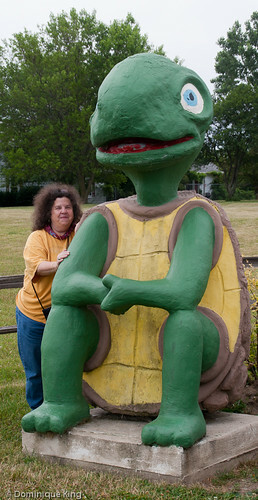 Connie, Midwest Wanderer, writes about this unique park in Battle Creek, Michigan. 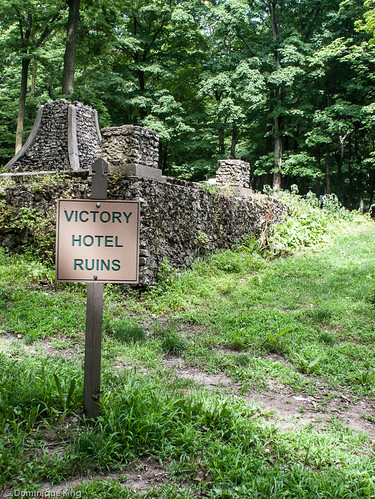 I'm surprised I have yet to get to this place, but it is definitely on my need-to-see list on one of our next visits to the west side of the state! Meanwhile, is it any wonder that I own both the book about Chicago Bridges by Patrick T. McBriarty that I mentioned above, as well as Historic Highway Bridges of Michigan by Charles K. Hyde (a college prof who I had for several classes at Detroit's Wayne State University)? 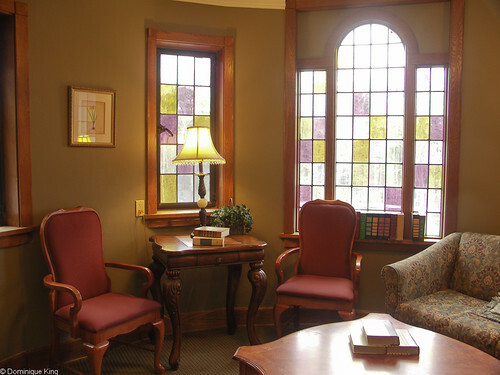 Punderson Manor State Park Lodge: Beauty and History in Geauga County, Ohio-The Manor at Punderson State Park Lodge is another favorite destination. I spent several years attending a writers' conference here, so I'm well aware of the park and the manor's haunted history! 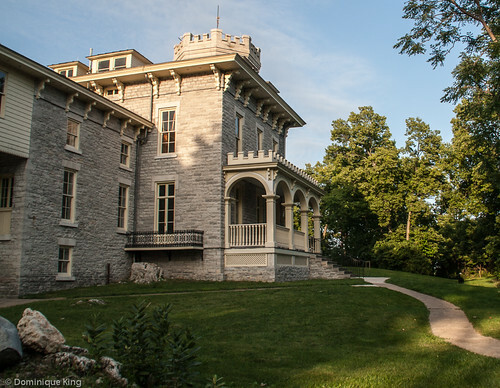 I really enjoyed reading Karyn's story and seeing that the manor remains as beautiful and elegant as I remember it from my prior visits (see my stories at Midwest Guest and the Discover Ohio blog) and check out Karyn's story at the Sand and Snow...and Everywhere in Between! blog. Remarkable Life, Tragic Death: Fairmount Boy James Dean-We had a chance to make a quick stop in Fairmount on our way home from Indianapolis earlier this summer and see the grave site and former high school of actor James Dean, so I was particularly interested to learn more about the legendary actor, his early life in this small Indiana town and his tragic death. Check it out at Jessica's Little Indiana blog. From motorcycles to jelly beans: 7 cool things to see and do in Wisconsin-Check out Scott's list of quirky Wisconsin attractions at the Quirky Travel Guy blog. Not surprisingly, there are a few places on his list that are on our own Midwest bucket wish list--the Harley Davidson Museum in Milwaukee, the Jelly Belly tasting room in Pleasant Prairie and the State Capitol building in Madison, to name a few. Need more Wisconsin fun? Check out Scott's second list of quirky Wisconsin fun at the blog this month-Donut chickens, dinosaur bones and cheese koozies: Discovering the offbeat side of Kenosha, Wisconsin. I'm ready for trip to the Badger State soon! Escape to Kelley's Island-We've visited Ohio's Lake Erie Shores and Island region multiple times, but we've yet to get to Kelley's Island. 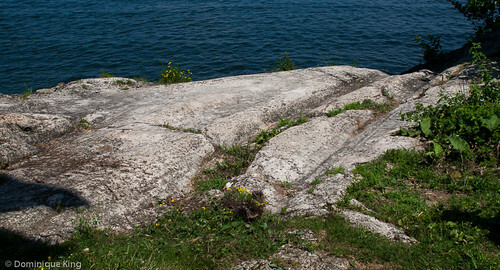 We did get a peek at some glacial grooves on nearby Gibraltar Island, but I understand that Kelley's Island is the place to really get a good look at this natural wonder.Check out Mike's story on the OHventures blog. Bully! Theodore Roosevelt National Park a gem in North Dakota-We traveled out to Wyoming and Montana some years back, planning our drive to go through the Dakotas. We only planned to drive straight through North Dakota on our way west, but we decided to stop at this beautiful National Park and badlands...and decided that a few hours were not nearly enough time to spend here. We've always wanted to return to North Dakota to spend at least a few days out near the Teddy Roosevelt National Park, so I really enjoyed reading about Lisa and Tim's adventure there. Read about it at the Walking Tourists' blog. Marshall Carriage Company Ghost Tour in a Horse-Drawn Buggy-Getting in the mood for Halloween? Check out Connie's story about this ghostly tour of haunted homes in Marshall, Michigan on The Midwest Wanderer blog. Illinois State Capitol: Take the Tour-Join Connie on a tour of the State Capitol building in Illinois. I love vintage state capitol buildings like this because they offer so much in the way of history, art and architecture. This post reminded me of our tour of the iconic state capitol building here in Lansing, Michigan. 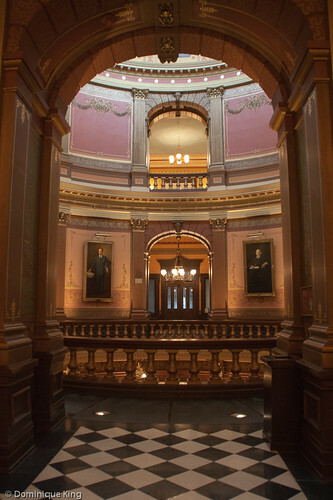 Check out Connie's story about the Illinois capitol tour at her Midwest Wanderer blog. Quirky Attraction: The Studebaker Museum-It's no secret that we love visiting museums with classic car collections like the Studebaker Museum in South Bend, Indiana, and to reflect Tim's experiences as a returning motorcycle rider, classic motorcycle collections. I enjoyed seeing Scott's take on the Studebaker Museum. Check it out at The Quirky Travel Guy blog. Meanwhile, do any of my readers know about any other good Midwest automobile or motorcycle museums we need to visit? Entry to the Ford Rouge Plant-Charlie finds the most interestingly obscure sports during his two-wheeled adventures around the Motor City! Check out this small park he found in front of Ford's huge Rouge plant just downriver of the city. The park has historical markers telling the story of the plant and labor history in Michigan. I especially enjoyed seeing the plaque dedicated to the female factory workers during World War II (a.k.a. "Rosie the Riveters"). Check it out at the Bikes, Books & A Little Music blog. Know Nebraska: Scottsbluff National Monument-Do you think of Nebraska as totally flat terrain? Muriel says "think again!" as she tours the scenic bluffs at this National Parks area in Nebraska. I found it especially interesting to learn that the Civilian Conservation Corps built some of the tunnels and other man-made features to make the park more accessible during the 1930s. Read about it at the Nebraska Outback blog. Haunted Iowa: Places to Visit-Looking for ideas for planning a ghostly road trip? Check out Deb's list of suggested haunted places in Iowa, which includes an "An Ax Murder House" and a couple of haunted bridges. She also suggests reading The Iowa Road Guide to Haunted Locations by Chad Lewis and Terry Fisk. Check out her story at Just Short of Crazy. 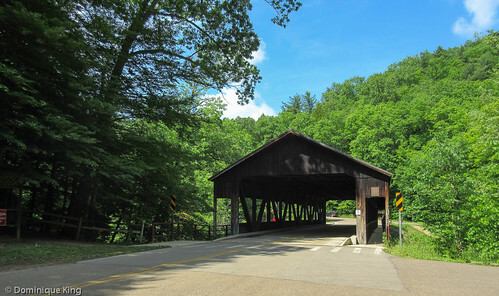 I've also posted a couple of ghostly stories here that include Is Ohio's Everett Road Covered Bridge haunted? and A ghostly tale in Elmore, Ohio about reported sightings of a headless motorcycle rider! Bob the Bridge-Join Adam as he visits the Bob Kerry Pedestrian Bridge and learn what it means to "Bob the Bridge". The bridge, which straddles the Mississippi River at Omaha, Nebraska and Council Bluffs, Iowa, allows visitors to stand with one foot in each of the two states at the same time! Read the story at the Visit Flyover Country blog. Explore Geneva-on-the-Lake-We visited this Ohio State Park several years ago, and it was fun to virtually re-visit is with Mike on his Ohventures blog. Situated along the Lake Erie coastline, the area near the park initially gained fame as "Ohio's first resort" and remains popular for family fun, its proximity to great Ohio wineries, hiking and biking trails and a number of covered bridges. Vincennes' Red Skelton Museum-I vaguely remember seeing Red Skelton's show on television when I was very young. The show went off of the air by the very early 1970s, but there is an Indiana Museum dedicated to Skelton's work as a much-loved comedian. The museum at Skelton's hometown of Vincennes, Indiana and Kayleen found it impressively interactive and modern. Check out her story at the Indiana Insider blog. The Wallpapers in Paul Laurence Dunbar's Dayton Home are as Lovely as his Books-When I spot someone who can make an interesting story about wallpapers, I know I've found a blogger after my own heart! I enjoyed reading about Betsy's visit to poet Paul Laurence Dunbar's home in Dayton, Ohio. 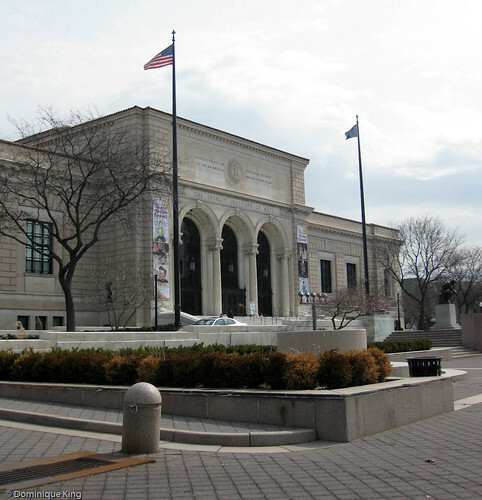 We learned a bit about the poet and his connection to Orville Wright during our recent visit to Dayton, and his home is now on our bucket list for a return trip to the city. Check out the story at beesfirstappearance blog. Smithfield Street Bridge in Pittsburgh: Sunset in the City of Bridges-Tim's sister and her family live in Pittsburgh, and I especially enjoyed seeing the city's bridges when we visited there. His sister, knowing of my love of bridges, made sure we walked across the Smithfield Bridge, telling us it was one of her favorite spans in the city. 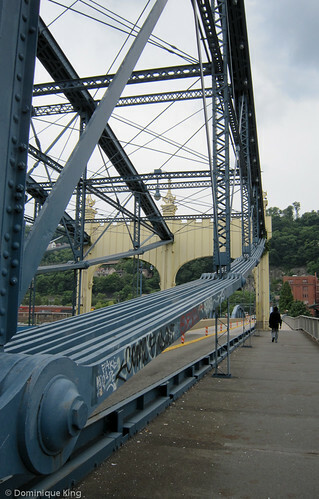 I can understand the appeal of this bridge and enjoyed learning of its connection to famed bridge builder John Roebling (who was also responsible for one of my favorite bridges in Cincinnati, Ohio). Check out Karyn's nice sunset scene at the Sand and Snow...and Everywhere in Between blog. Capturing images with my camera is a large part of what I do when I start researching a story here at Midwest Guest. Tim and I both invested in good quality cameras long before I had this blog--and long before there was such a thing as a digital camera. Tim even had a darkroom set up in the basement so he could process his own photos at one point. This year, Tim became president of the Motor City Camera Club, a group he joined a few years ago. I've gone with him for occasional club programs over the past few years, but I had no intention of joining or entering and competing any of the club's monthly photo competitions. I somehow ended up becoming a member of the club a couple of months ago (and sorting through my photo archives and heading out with the club for some of their photo shoots). I've actually placed a few images in club competitions, so it seems like a good time to run a few more Photo Friday features. Today's image is one that originally appeared here with a story about the Duquesne Incline in Pittsburgh, Pennsylvania. 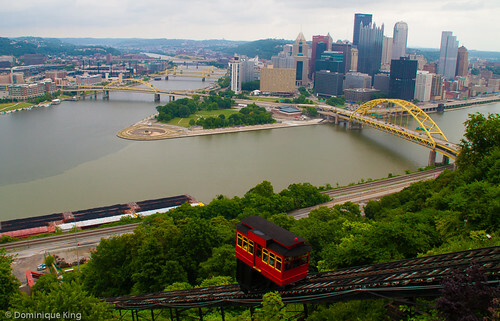 I liked this view from the top of the incline, especially because it included a few of Pittsburgh's famous bridges. Pittsburgh Bridges placed third in the Digital Photo competition assigned topic category (Bridges/Park Bench) for December 2014. You can also connect with the Motor City Camera Club on Facebook. 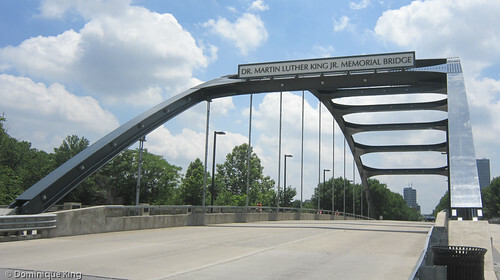 Even though the bridge spanning the St. Mary's River at U.S. 27 near downtown Fort Wayne bore an official designation as the Martin Luther King, Jr. bridge, a renovation of the span and the addition of decorative truss-like arches, inspirational inscriptions, signage and a plaque bearing the image of the revered civil rights leader in mid-2012 transformed the bridge into a gateway entrance to Fort Wayne and true memorial for Dr. King. Issues like improving the bridge's appearance, minimizing the impact caused by the river current to the bridge and improving the bridge's functionality for pedestrians and bicyclists as well as vehicular traffic dominated the project planning discussions for the state's Department of Transportation. 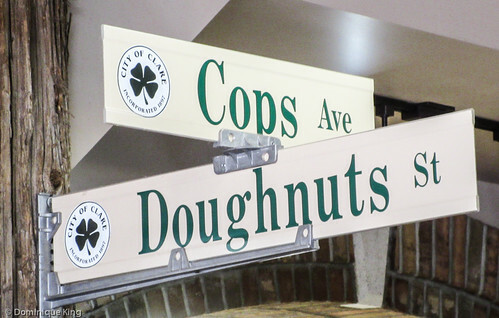 The city of Fort Wayne, meanwhile, wanted a design that would make citizens more aware of the bridge's name and purpose as a memorial while creating a distinctive gateway to the downtown area. Work started on the bridge during the summer of 2010, with the finished $8.8 million project's dedication happening in June, 2012. We drove across the bridge as we entered Fort Wayne during our most recent visit there this past summer, and I was able to take a closer look at the span as we took a bicycle ride along the city's Rivergreenway Trail. The trail runs under the bridge, and stopping to climb up a short staircase from the river took me to the bridge with its pedestrian-friendly sidewalks, decorative paving, interpretive signs and decorative lighting at street level. The bridge was impressive enough during the day, but I'm hoping to see it again sometime during the evening as a system of 704 LED light fixtures requiring 14,000 feet of electrical wire allows the city to illuminate this landmark with lights in different color schemes and patterns. The bridge can sport red-white and blue lights on the Fourth of July, red and green lights in support of Fort Wayne's beloved Tin Caps baseball team or other arrangements to honor special events, holidays and seasons. Dr. Derek King Sr., a nephew of Dr. Martin Luther King Jr., attended the bridge's 2012 dedication and noted that Fort Wayne's choice of a bridge to honor his uncle and his legacy was particularly appropriate as the city "dedicated a bridge to a bridge builder". 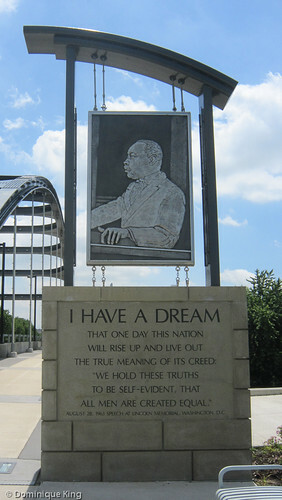 Want to learn more about Dr. Martin Luther King Jr.? Try checking out Death of a King: The Real Story of Dr. Martin Luther King Jr.'s Final Year by Tavis Smiley with David Ritz or A Testament of Hope: The Essential Writings and Speeches of Martin Luther King, Jr. The Wrought Iron Bridge Company of Canton, Ohio was one of the most prolific bridge manufacturers during the late 19th century in the United States. The company specialized in designing bridges for locations throughout much of the Midwest (as well as Canada and Mexico), fabricating the bridge parts and shipping the parts and plans via rail for assembling by local labor at their ultimate destinations. Today, there are maybe a dozen of the nearly 4,300 spans manufactured and erected in this way by the company that still exist. The Maple-Foster Bridge over the Huron River near Ann Arbor in southeast Michigan is one of two surviving Wrought Iron Bridge Company spans standing within a few miles of each other. I wrote about the nearby Delhi Bridge here a couple of years ago, but we recently took another ride out to Ann Arbor so I could take pictures and learn a little more about this similar span on Maple Road just off of the scenic Huron River Road. The Foster and Delhi bridges both boast similar construction as eight-panel, pin-connected Pratt truss bridges. These single-lane bridges both have main spans about 120 long feet and 16 feet wide. The Delhi Bridge was the first one of these two spans to catch my eye years ago because of its head-turning bright orange paint job, while the Foster Bridge wears a little more sedate coating of forest-green paint, which it first wore during the 1940s. It's also easier to capture a decent image of the Delhi Bridge because there seem to be fewer power wires obstructing views of that span. These two bridges are among the oldest metal bridges in the state, although it appears that the Foster Bridge may predate the Delhi Bridge by a few years. The Delhi Mills area was a thriving community with flour, woolen, plaster and saw mills during the mid-to-late 1800s. 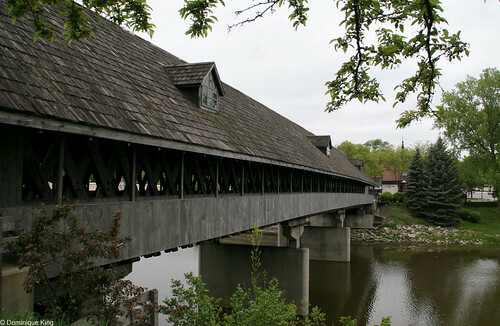 Early bridges in the area made it easier for residents and those traveling to and from the mills by allowing them a drier way to cross the Huron River, rather than fording the river with their horse-drawn vehicles. 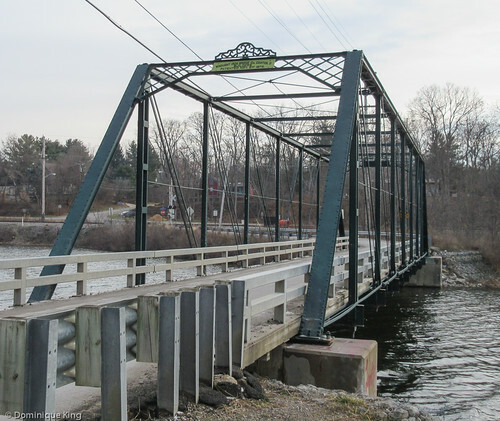 A mill closing next to a mid-1800s wooden bridge in the area moved Washtenaw County to contract with the Wrought Iron Bridge Company of Canton to replace half-dozen spans there with metal truss bridges during the late 1800s. This explains the proximity of the Foster Bridge to its sister bridge at the Delhi rapids. The Foster Bridge is a pretty typical example of the earliest bridges by the company that display a plaque with an 1876 patent date, but no construction date, and decorative cresting atop the bridge. Based on this fact, one historic bridge site speculates that this bridge may have a construction date closer to 1880, as opposed to the slightly later construction dates I've found assigned to the Delphi Bridge. Much like the Delphi Bridge, the Foster Bridge faced possible demolition and replacement with a new two-lane bridge in around the turn of this century, but citizen intervention and support led to its rehabilitation in the first decade of the 2000s. The Foster Bridge had an eroding deck, peeling paint and severe weight limitations before its rehabilitation. 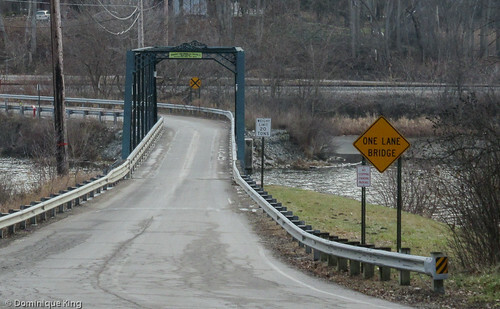 Washtenaw County set a 6-ton weight limit for the bridge, meaning that the span could not accommodate larger and heavier traffic like school buses or emergency vehicles, severely limiting its usefulness to its community. Washtenaw County studied the idea of demolishing the bridge constructing a new two-lane bridge just upstream or downstream of the site. The trouble was that all of the demo and new construction options meant that some residents north of the river in the area might lose part of their properties, and there was also the little matter of a projected bill of $1-$4 million to complete the job. Area residents prevailed upon the Road Commission to explore the idea of rehabbing the bridge and organized the non-profit Citizens for Foster Bridge Conservancy to raise money to hire a group of consulting engineers to inspect the bridge, test materials, do a load rating analysis and identify rehab options. 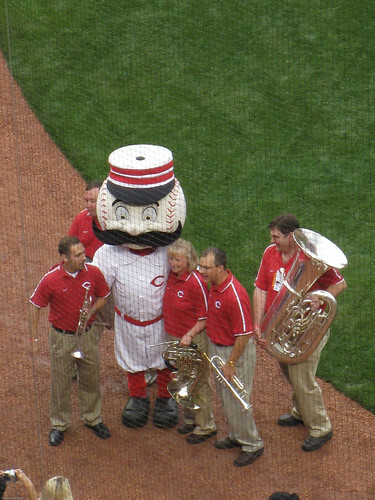 The rehab took place over six months in 2003. Today the bridge has a 20-ton weight limit and could have another century of service life. Even better, the presence of the old bridge helps maintain the area's rural character and serves as a record of its nineteenth-century history. Be sure to check out my story, Wrought iron bridge links Michigan and Ohio, to learn more about this area and the two Canton bridges. 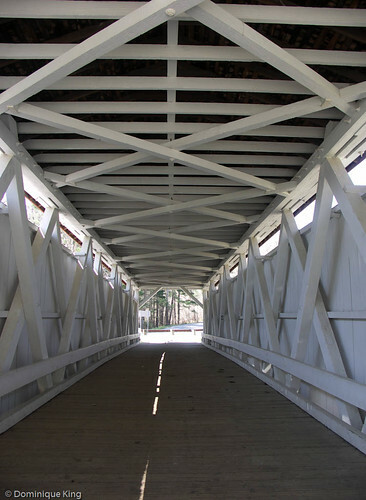 Interested in learning more about the history of Michigan's other historic truss bridges? Check out Historical Highway Bridges of Michigan by Charles K. Hyde.